Create your own Trader Joe's List for a chance to win 1 of 10 $25 gift cards to Trader Joe's! We've teamed up with Skinny Scoop to bring you a collection of 101 Trader Joe's most popular items. 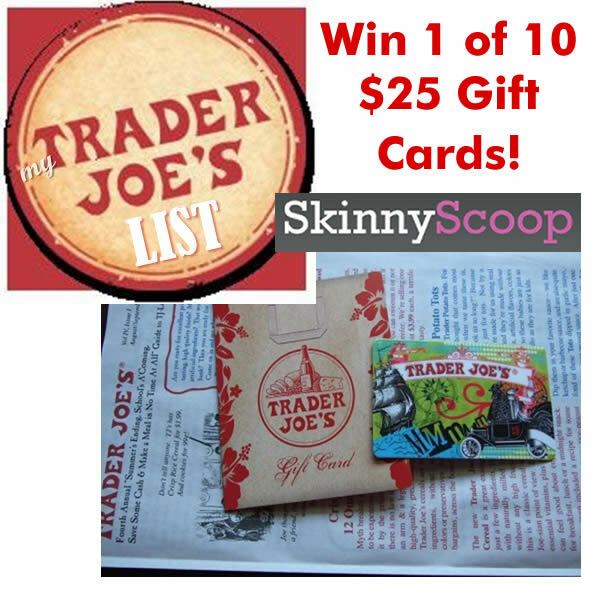 Create your own Trader Joe's List with at least 5 favorites and Tweet it @TraderJoesList and @skinnyscoop to be entered into the drawing for a $25 gift card. Pumkin cream cheese. Just tried this a week ago. Less sweet than other kinds sold in grocery stores. Had a stronger "pumpkinny" taste. Pizza dough. Can make into any kind of pizza you can imagine with ingredients found at Trader Joes. Also makes good focaccia bread. Peppermint Joe Joes. Just not Christmas without them! Chicken Fried Rice. Add scrambled eggs and crispy bacon, top with green onion, for a delicious Sunday brunch item. Charles Shaw Wine. Everyone loves 2 buck chuck! My favorite is cabernet sauvignon blanc. Forgot to leave my name for contest entry for above comment. Louise Thewlis on twitter @Louise1027.